"I feel like I was just handed an 'easy button' for real estate searching!" "I love the KW App! I was able to find the house of my dreams in a distant city while traveling. Keller Williams also has access to ALL the houses listed ... other services I tried only offered minimal listings." "Best app in real estate. I can search for properties all over U.S. and Canada. Awesome! Love that it immediately shows the nearest property wihtout having to click one button." "I love how the app brings up properties closest immediately. When I'm using a mobile search it's because I'm looking for more information about a home I see as I drive by." "This app beats the heck out of any of the other real estate apps I've tried, I LOVE the map function and being able to do so much without leaving the screen. Elegant, clean design, wish all my apps were this intuitive." "I've used lots of different "home finding" apps in the past and what makes this one my favorite is how quickly you're able to slide through the pictures of each home. Faster than any other app I've seen. Love it!" "Connecting directly with my agent is awesome. No longer forced to wade through dozens of brokers to get home info. I feel like I was just handed an 'easy' button for real estate searching!" Add search filters like price, number of beds, open houses, and more. Easily share homes through email, Facebook, or Twitter. What is the Keller Williams Realty Real Estate Search app? How does the Keller Williams Realty Real Estate Search app benefit me as a homebuyer? This user-friendly, robust app makes finding a home to buy or rent snap. You don't only have access to homes associated with a Keller Williams Realty agent, but access to all homes in the CREA database. Save searches and listings based on your dream home criteria. Plus, a Keller Williams agent is just a click away to provide more information or schedule a walk-through. How does the Keller Williams Realty Real Estate Search app benefit me as a home seller? With this app, your Keller Williams listing agent has another crucial outlet to find homebuyers. Your home automatically appears in this GPS-enabled app with a stylish photo gallery and listing details to showcase your home whether the homebuyer is searching at home or on the go. Ask your agent for the web site link to download their app directly from your smartphone or tablet. Depending on your device, choose the Apple App Store or Google Play Store to download. Then enter their personal code to make him or her your Keller Williams agent within the app. Where do I find the app once I download it? On the iPhone, iPad and Android phones, the app icon will appear on your menu screen along with other apps you have downloaded. What devices support the Keller Williams Realty Real Estate Search app? Soon, a mobile web version similar to the app will be available when you visit www.kw.com from your smartphone web browser. Is there a fee to download the Keller Williams Realty Real Estate Search app? No, this app is FREE to download. What is the difference between the downloadable app and the mobile web version? The downloadable app and the mobile web version allows Keller Williams Realty Real Estate Search to reach virtually every cell phone and tablet user. If a cell phone cannot support the full downloadable app or if your carrier charges a fee for your device, then the free mobile web version is the best alternative for property search from your cell phone. Are commercial listings displayed in the app? Yes, if a commercial listing is included in the data feed that you are searching, then they will be included in the search results. What if I don't have a Keller Williams agent yet? 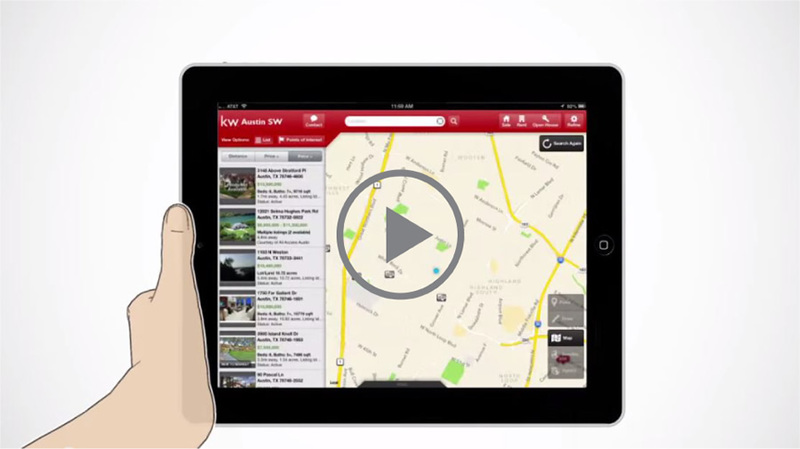 The version available in the app stores is the Keller Williams Realty national version. Use this version if you don't yet have a Keller Williams agent to find one in your area. Just tap on Office Search or Agent Search in the app. If I have my agent's app, can I only search only my agent's coverage areas? No, you can search anywhere; however, when searching for properties outside your agent's area, the app branding will update to the Keller Williams Realty franchise version. How do I give a rating or write a review about the app? Once you've downloaded the app you will occasionally be prompted to provide a rating. You can also provide a rating or write a review from the Apple App Store or Google Play Store directly. My phone has GPS capabilities, but I'm not given an option to search using GPS with Keller Williams Realty Real Estate Search. Why not? On some phones, the carrier locks out the GPS ability to third-party applications such as Keller Williams Realty Real Estate Search. This is common with older BlackBerry models. Since the release of the BlackBerry Storm, all newer BlackBerry devices have GPS capabilities within the Keller Williams Realty Real Estate Search app. If your phone does not offer the GPS search, you are still able to search by address, zip code, city, or listing number. When I try to search by GPS, I get a message saying it is unable to pinpoint my exact location. Many GPS-enabled phones require a clear view of the sky in order to get an accurate location. Try changing your location and search again. GPS search will not work indoors with some phones.